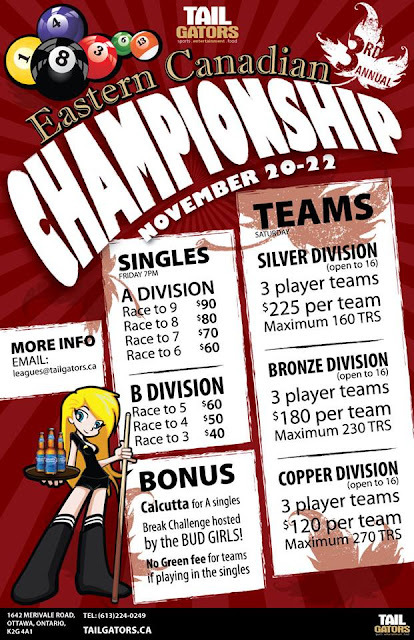 Tailgators located in Ottawa,Ontario is pleased to announce the 3rd annual Eastern Canadian Championships. This is a handicap Bar Box event with staggered entries. For the first time this year there will be two separate divisions, listed as "A" and "B". In the A division players who's handicap range from 6-9 will play in a separate tournament against one another, while handicapped players from 3-5 will play only also play each other. Another addition this year is the team events. This is something that has had a lot of success at this location as it host the annual Ottawa Bar Box Championships every January, which see's dozens of teams enter. Curtis Houlden is now excepting registrations. he can be contacted by telephone or email this information can be found in the poster above. The team divisions are open to the first 16 teams to register and players who play in the team events are encouraged to play in the singles as well. If you know any Bar Box "legends" who want to take a shot at some of the best players in Eastern Canada please share this post with them! In the past this tournament has seen the likes of John Morra, Erik Hjorleifson Jeff Blais and many more great players. These tournaments usually fill up so don't get left out and register today! G.T.A 404 Series: Pagsalakay ng Pinoy!